With the more frequent conversation here, on social media, and in my office, I’ve had more people recently pull me aside and ask, “What is depression? I think I might struggle, but I’m not really sure.” That’s not so unusual. Many patients come into my private practice, struggling with depression, but they don’t realize it until I diagnose it and tell them. That’s in large part because depression presents differently for everyone. There is no one size fits all for depression symptoms. 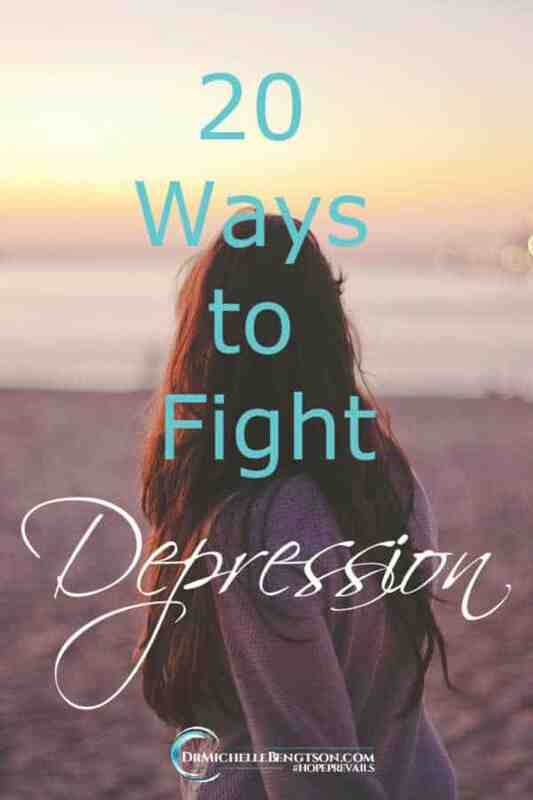 It presents differently for different ages, different genders, and different races, so that contributes to some of the difficulty understanding whether or not you struggle with depression. 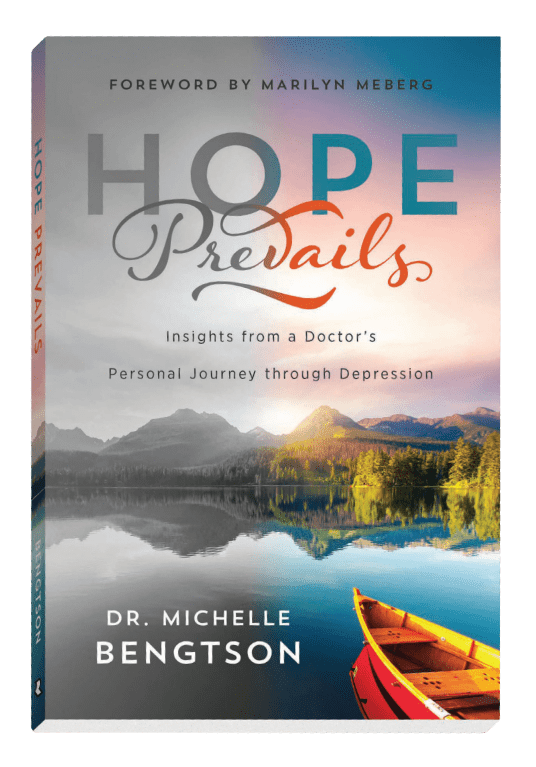 When I wrote my book, “Hope Prevails: Insights From a Doctor’s Personal Journey Through Depression,” I started by asking a few questions, just to get people to start considering whether or not this was something they struggled with. 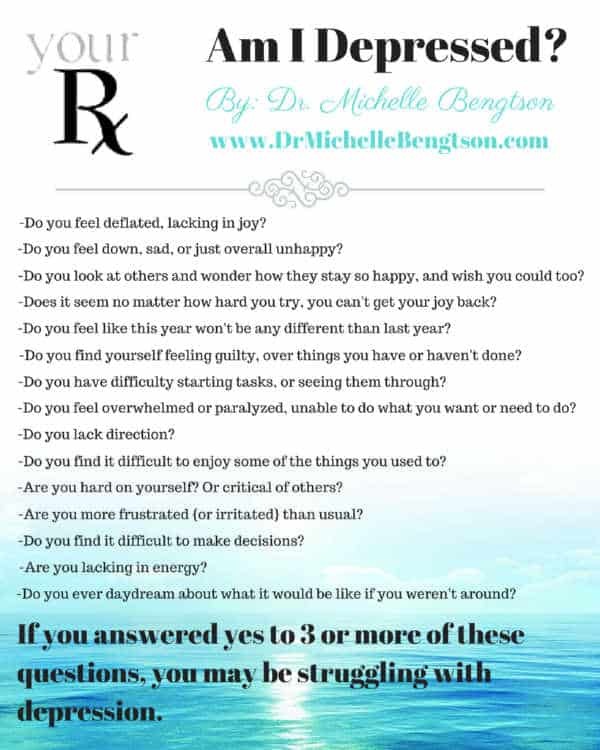 If you answered yes to any one of those questions, it does not necessarily mean you are depressed, but it might suggest that something is going on that we need to address. Especially as we move into the winter months, it’s important that we are aware of how we respond. The winter months can lead to an increased likelihood of depression in some cases, something we call “Seasonal Affective Disorder.” I’m originally from Michigan, where many experience seasonal affective disorder when the sun doesn’t shine as much as it does in the southern states. I was prone to struggling, as was my mother, during Michigan’s long winters. 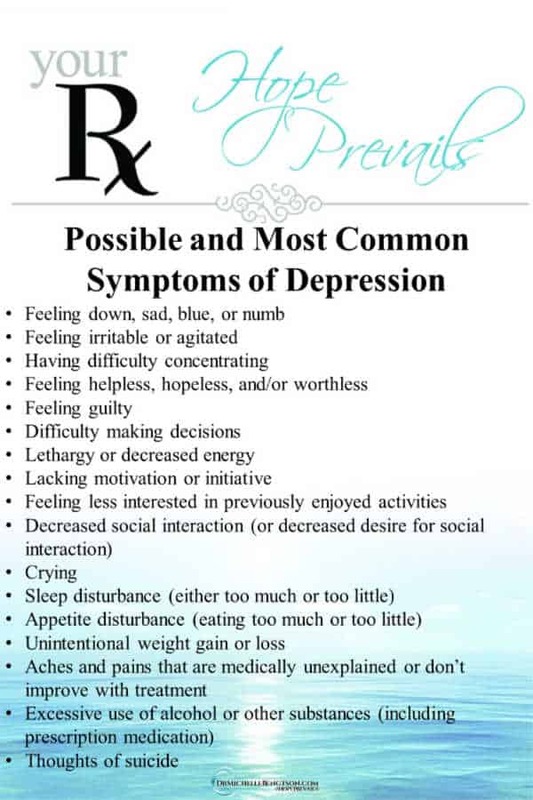 You don’t have to have all of these symptoms in order to be depressed. In fact, rarely will anyone possess all of these symptoms at one time. But if you have experienced more than a couple of these symptoms for more than a couple weeks at a time, there is a strong likelihood that you have suffered from some degree of depression. It’s also important to note that the symptoms will vary for each individual. How one person experiences depression can be completely different from how another person experiences it. 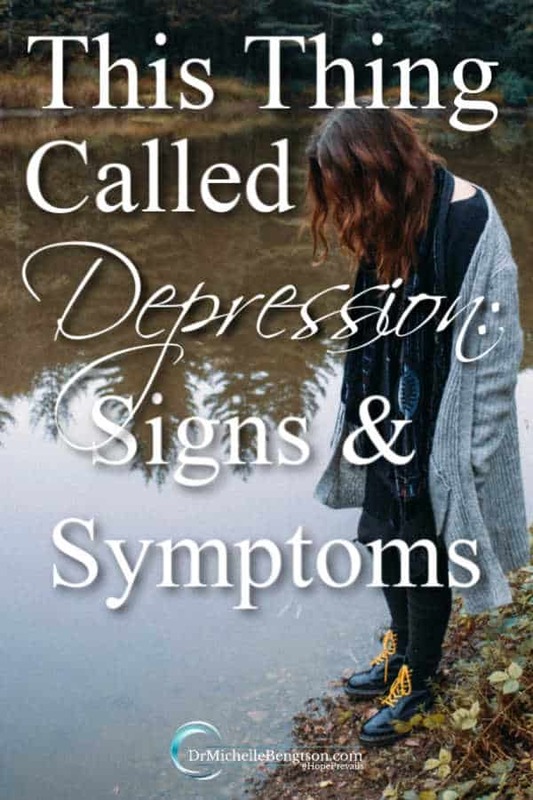 But if you find yourself reading those signs and symptoms, and can identify with three or four of those, and they’ve lasted more than a couple weeks, I’d suggest you schedule an appointment with your doctor to rule out any medical diagnoses which could contribute to signs and symptoms of depression. 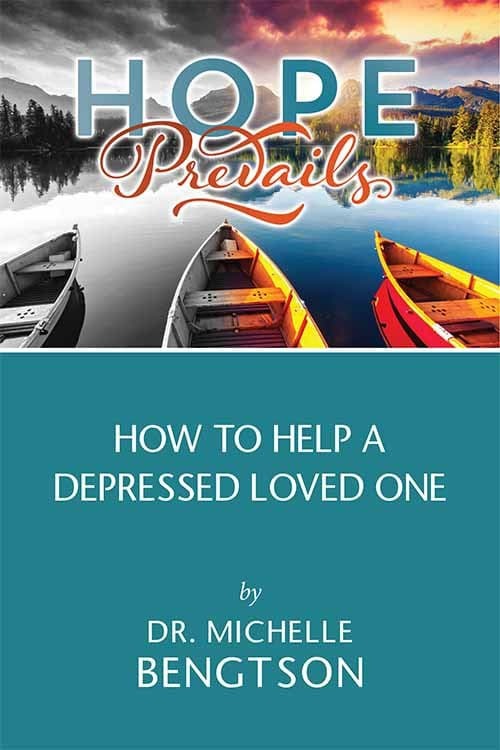 I’d also recommend you pick up a copy of my book, “Hope Prevails: Insights From a Doctor’s Personal Journey Through Depression” as well as a copy of the companion “Hope Prevails Bible Study”, both of which were written with YOU in mind, as a resource for all those who are struggling and couldn’t make it into my office. 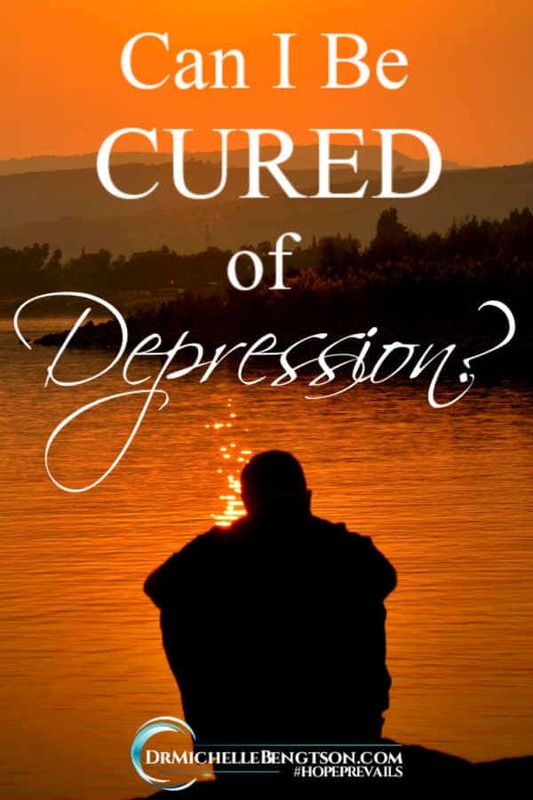 In those two books are my greatest professional knowledge and personal experience to guide you toward help, hope, and healing for depression. 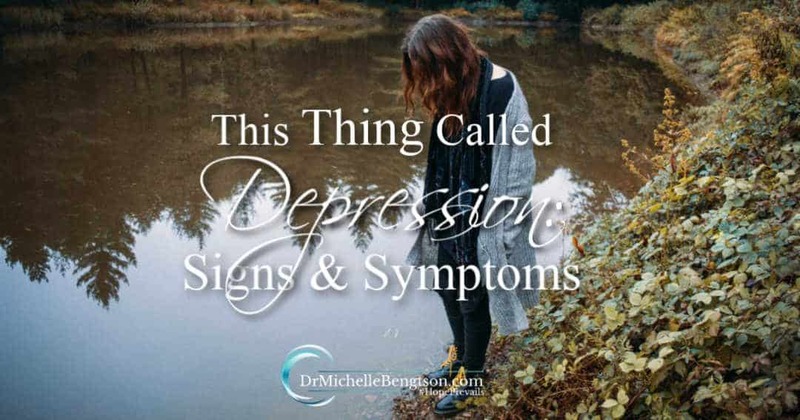 What I really want you to hear, is that if you identified with those signs and symptoms, either for yourself or for someone you love, know that there is no shame in suffering from depression. There is no more shame in suffering from depression than there is in being diagnosed with allergies or diabetes. And the good news is that Scripture says, “There is therefore now no condemnation for those who are in Christ Jesus” (Romans 8:1). God doesn’t look at you and think less of you because you’re depressed. Quite the opposite in fact. Scripture says, “The LORD is close to the brokenhearted and saves those who are crushed in spirit” (Psalm 34:18). There is no shame in depression. Shame comes from the enemy of our soul. And there’s no reason to hide. God already knows what you’re struggling with and He wants to heal you and give you hope. I’ve gone through it. I, too, experienced shame. I was the doctor who had been treating patients for over 20 years, when I suffered through the dark night of my soul. I thought I was supposed to be able to prevent that from happening to me, and to have all the answers. Sometimes experience is a very valuable teacher. I understand what depression is, how it presents, what it feels like, and how to treat it much better now that I’ve personally experienced it. But during those dark days, I was embarrassed and ashamed. 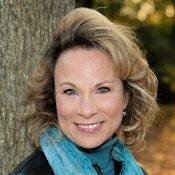 I thought, “What if my patients knew?” “What if my colleagues knew?” “What if my referral sources knew?” But that worry and fear was from a lie from the enemy. What I now know is that since I’ve gone through it, I’m a better doctor! Now I’m a better friend. Now I make a better colleague. Because now that I’ve gone through it, I understand! Now I’ve got more empathy, and even more compassion. Now when someone says that they are struggling in the pit of depression, I can enter into the dialogue and say, “I’ve been there. Me too. I understand.” Then we can have an honest discussion because I can come to it from a place of knowing and understanding. If you are struggling today, remember, there is no shame in that. There is no shame in the fact that you need help. We ALL need help with things from time to time. And that’s okay. The truth is, help and hope are both available. God wants to be your biggest source of help. And with Him, #HopePrevails! So whether you are going through depression today, or anxiety, or relationship difficulty, or a health crisis, or whatever it is, He knows the plans He has for you, and they are good. He’s going to get you through this! Know that you are dearly loved, and I am praying you have a hope-filled day! We must be on the computer at the same time in the mornings because I’m your neighbor over at #AWiseWomanBuildsHerHome today. Love this post.I agree that we don’t talk about it enough in church. And when we do, often we hear people say things like, God will heal you. Which he can, but that may not be his plan for you. He may need you to learn things through the journey of depression. Nice to see you again! I do believe God can, and often does, heal us. But I also think He is more interested in molding and shaping us to be more like Him, and that often happens most when we are desperate enough to admit our need for Him. Blessings. Thanks for asking questions and sharing wisdom and hope. Blessings to you! Welcome Mari-Anna. I’m so glad you visited today. 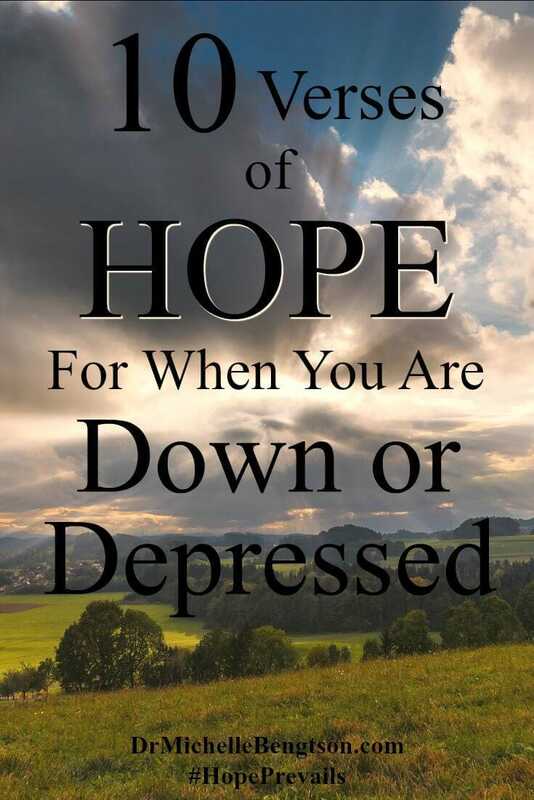 I pray this does offer wisdom and hope, not only to those who struggle with depression, but also for those who love them. so glad you’re addressing this – thanks, Michelle. Hope you are doing better. Thank you Sue! I pray it either educates or encourages others. Depression is very painful and difficult! Thank you for sharing the signs and symptoms. And, most of all, thank you for sharing God’s grace. Other believers are not always able to demonstrate that grace and can be extremely judgmental when they do not understand. But I believe God has a purpose in it. He can and does heal some from depression, I know He did me. But, more importantly than that is, in the process He drew me into deeper intimacy with Him through it all. Great post! 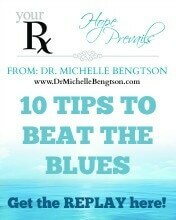 Dr.Michelle – Thank you for this great post on depression. Yes, we need to talk about it more. I will share this in a few places. Question: I lead a group at our church Circles of Hope: Mental Health Support and we currently have a group for families with a loved one with mental illness. We are wanting to start something for those who are experiencing a mental illness. Would your book be a good place to start. Would you have any other guidelines you might want to share. 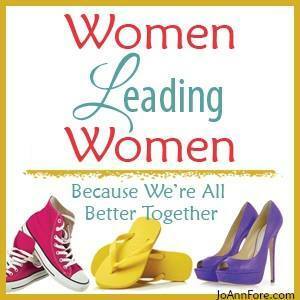 We plan to have it peer led. Thank you for sharing with Grace and Truth Christian Link-Up. Blessings and Prayers going your way. Up until a couple of years ago, I hadn’t really battled depression but I can see how it’s been a struggle from time to time over the past few years… I also have several friends who deal with depression and other mental health issues. I hope and believe that some of the stigma IS easing up because more (like you!) are willing to be honest and open about it! I hope the thoughts on 2020 are wrong – but it’s not a stretch to see it is possible! I hate for anyone to experience depression, because I know how painful it is and how debilitating it can be. But I also want to be obedient to do what we are told in His word to do, and to comfort others with the same comfort He gave me. For truly, the way to defeat the enemy of our soul is by the blood of the lamb and the word of our testimony. If my sharing from my own places of brokenness helps someone else, then it truly is beauty for ashes. Because of Him, #HopePrevails! Wow, so much of this sounds like how I also share about depression with others (but I’m not a Dr.) I have been healed from my depression and suicidal thoughts for several years. I’ve written a couple blogs about it. The Lord’s marvelous hand gave me a job in a faith based ministry. 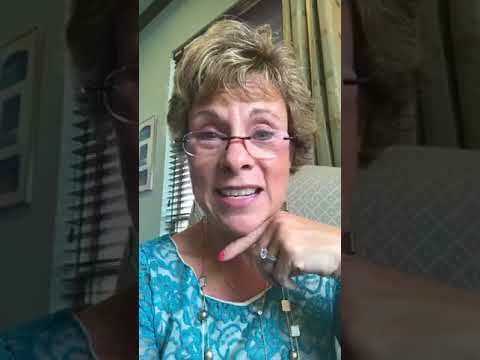 I work as a Hope Coach, I take online chats for our crisis chat line. God didn’t waste my past emotional pain and through that I get to share about God. 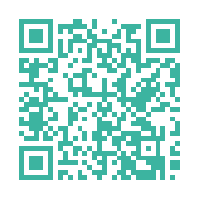 We have lots of free resources we give them as well. 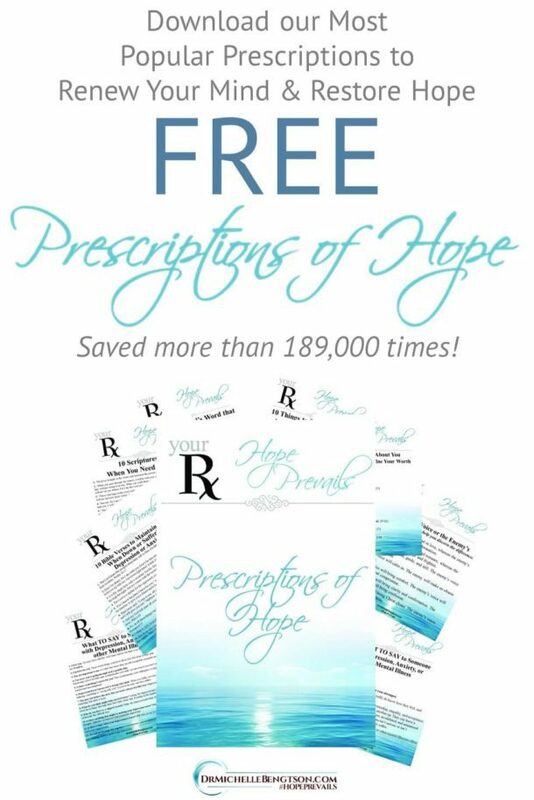 I of course know that counseling and meds are many times needed as I did for a time. Wonderful how you are being used as a vessel for God in pointing others to Him. Visiting from #faithfriends featured post link. April, I’m so grateful when God uses our pain to encourage others. Truly, what the enemy intended for harm, God will use for good. You and I can both testify to that! #HopePrevails!